Chocolates, peppermints, pies, cakes, cookies, and endless plates of other homemade goodies are popular during the holiday season. With all of these options, eating sweets in moderation can be difficult, especially if you have a sweet tooth. During this exciting time of the year, smart choices can help you maintain a healthy smile. Avoiding sweets is easier when sugary treats are replaced by healthier foods. Instead of forcing yourself to say no to all the treats, consider foods that are better for your oral health. A great place to start healthy options is at your own home. These options will save time, too. You will have more time with your family and friends when you do not spend hours in the kitchen baking cookies. Here are some great alternatives for holiday season munchies. Mixed nuts are packed with protein and fiber, and contain no sugar—place a bowl of these on the table for your relatives to enjoy. You can also prepare a trail mix out of nuts, unsweetened cereal, and pretzels. Cheese and cracker platters are a delicious and an excellent source of calcium. Trays of fresh, sliced fruits or vegetables are another nice addition to holiday parties at home or at your office. While you are eliminating sweet snacks, you can also take a healthy approach to desserts. Your family and guests will be delighted to see healthy desserts on the dinner table. For example, baked apples are an easy and seasonal replacement for cakes and pies. Stuff the apples with slivered almonds and raisins, and add a dash of fresh cinnamon. This dessert takes little time to prepare, and everyone who joins you for holiday dinners will enjoy it. How Do I Stop Being Addicted to Sugar? Many of us have an unhealthy addiction to sugar, and eating a lot of sweets can cause cavities and other issues for your oral health. The best way to eliminate a sugar addiction is to convince yourself sugary treats are unnecessary. While this is easier said than done, it helps to surround yourself with the support of others trying to do that same thing. It is also beneficially to have a ready supply of healthy and appetizing alternatives like the ones listed above. You can also contribute healthy foods to office parties, and parties at your friends’ homes. Your friends and coworkers will appreciate a healthier option, and it will give you something to eat instead of cookies and cakes. They may leave the sugary treats behind, and take a healthier approach to the holidays as well. 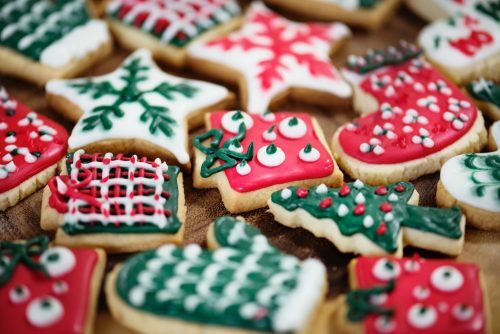 You may not think of the holiday season as the ideal time to kick a sugar addiction, but you can definitely benefit from avoiding sweets and learning healthier habits. Nutritious food and oral health go hand-in-hand. When you make tooth-friendly foods a part of your holiday experience, these new habits can continue into the new year. If sweets are not the focal point of the holidays, you may realize you can have delicious meals and great parties without them. You can move into the new year with smart choices, good nutrition, and great oral health. It is equally important that you will be able to introduce your loved ones to new, healthy choices. Adults and children alike can learn to appreciate sugar-free snacks and desserts. While they might grumble about it at first, these lifestyle changes can help your friends and family break the sugar habit and live a healthier lifestyle! Contact us to learn more about keeping your teeth healthy during the holidays, or to schedule an appointment. Why Is It Important to Receive Annual Dental X-Rays?Why Are My Teeth Sensitive?